December 1 the start of summer and also the day of the FREMANTLE SOCIETY AGM at the Film and Television Institute in Adelaide Street at 6 pm. If you are interested in Fremantle‘s future, come along and meet of a group of very dedicated, community minded volunteers, who have Fremantle’s best at heart! The FREMANTLE DOCTOR blog by Michael Swanepoel is one of my favourite Freo blogs, because Michael is down to earth, writes, well, makes sense, and knows what he is talking about when it concerns city planning. He is a strategic city planner in another city. You will know Michael’s name because he stood for the inner city ward of Fremantle council at the last local election. An article in the USA published The Atlantic by Kaid Bensfield, who is a director of the Sustainability Communities and Smart Program at the Natural Resources Defense Council, should interest us here in Western Australia, especially Fremantle. Bensfield writes that “a research team has found that distressed neighbourhoods where vacant lots have been converted into small parks and community green spaces are associated with reduced crime when compared to neighbourhoods with unimproved vacant lots. Upon reading the article Western Australian Labor MP John Hyde suggested on Facebook that suburban lots that have been vacant for more than a year should be converted into green spaces or parks. That is a good idea I believe, which I’d like to take further and include vacant retail spaces. Once a retail space has been empty for more than six months, the building owners should be told to make public art works out of the shop windows, so we don’t have to look into ugly empty spaces, that discourage people to linger and shop. Vacant ground level buildings invite vandalism and anti social behaviour, in my opinion, because they look as if no one cares about the appearance of the city. OH MCTRAIN YOU HAVE DONE IT AGAIN! Coming back from Cottesloe on the train I noticed a Transperth sign warning travellers on the Fremantle line that the last train from Freo to Perth will run at 7.31 pm this Sunday, December 4. Doesn’t Transperth know that many, many thousands of people will be in Fremantle on Sunday for the international ISAF 2011 sailing championships and the Fremantle Festival, which will be running the Festival Parade through the city in the afternoon? Those people might like to stay on for dinner and enjoy the Worlds Village on the Esplanade, but will then have to fight for limited bus seats to get back to their hotels and homes in Perth and beyond. Maybe the Transperth people think that ISAF is being held in Perth, it’s after all named Perth ISAF 2011. Well done, McTrain, you have done it again!! Pack the kids in the bus, car, or on their bikes and come into Freo on Friday evening, when the City of Fremantle will show off its new Christmas lights at Kings Square, while the Fremantle Dockers also have lights in the huge pine tree at South Fremantle oval. Once you have seen these lights (from 7.30) walk through High Street to admire the stunning Projections on High on the heritage buildings, and keep going to the Fishing Boat Harbour, where they also installed Christmas lights. Still not enough? Cross the railway line back to the Esplanade for the Worlds Village and listen to Broome’s Pigram Brothers! My thanks go to the heavens for giving us Perth Lord Mayor Lisa Scaffidi, who has finally revealed who in the world invented fireworks shows. I have always been wondering who it was, so now I know. It was the City of Perth of course! Her Lordship told the West Australian newspaper that the big fireworks Ocean Sky Show for Australia Day, a combined effort by Fremantle and Cockburn, lacks originality, and that our celebrations in the port city should have more imagination and not staging another fireworks show. Hey Lisa, at least we can just look at the fireworks exploding over the Fishing Boat Harbour and watch all the stunning reflections in the water, while your Perth show forces people to look at all your bland and ugly highrises as well. With the apparent haste to develop the inner city of Fremantle into multi storey large residential and office blocks, with street level retail added for the sake of ambience, one needs to ask what is essentially wrong with Fremantle, the unique heritage tourism city that attracts thousands of visitors by being itself. All over the world there are places that mainly live from tourism, so why do we have a problem doing the same? People say we can’t remain just a tourist attraction, but why not? Instead of developing for more office space, we could develop for more tourist space. Tourists come seven days a week, not just on working days as office workers do, and neither do they only come on weekends, as the suburbians do who frequent Freo for a cheap meal and parading the cappuccino strip. If Fremantle was willing to be mainly a tourist destination, we could develop for that, building a good hotel or two, creating more places of interest for tourists to visit, so they’d stay in town longer, eat, drink and shop here and make retailers happy. There are not enough things to do some would say, and I agree, so let’s start creating them. We need a good cultural centre that has got music and live theatre most days of the week, what about Greg Nannup running his Aboriginal walking tours daily, and another Heritage Walk through the West End. The city of artists could also have more open studios. When Artsource have them hundreds of people turn up, so maybe artists can rotate to have their studios open one day a week or fortnightly, so visitors to the city can come and have a look and a chat. Art galleries could also work together and do art tours in mini busses to the different art venues. There needs to be a What Is On Today/This Week in Fremantle website, so people can find out where to go at night and during the day. Is there live music at the Norfolk Basement, Clancys, the Fly, Mojos, what’s on at Deckchair, Spare Parts, the movies, is there a cricket or hockey game on at Stevens reserve, are there sailing regattas one can go and watch, is there an art exhibition opening one could attend and meet locals, where can they learn sailing for some days, or meet Aboriginal people for a story telling session. There should be computer touch screens all over town, where visitors could look up this information, and these would also have a street map of Freo, something tourists find hard to get, unless they find the Visitors Centre at Kings Square by chance. So there should be street maps made available at the train station and cafes and retailers should have them, so visitors also know about the CAT bus services and long-term parking. Let’s have roaming tour guides instead of only the stationary ones at the Town Hall. The more tourists Fremantle can attract, and the more they stay overnight here, rather than in Perth, the more they will spend here, which will create new jobs for people working in new hotels, bars, cafes, and other tourism related businesses. When we create more things to do for visitors, we create them for the entire Fremantle community, because all forms of leisure activities and entertainment will benefit us all, so we will all want to go out more often in the evenings, to see great live shows, listen to beautiful music, and watch sunsets from great little bars and restaurants, some of those on the top floors and roofs of new iconic six storey buildings, like that brand new modern round Round House boutique hotel in the city centre that juxtaposes the historic old gaol in the West End. Tourism could be a great future for Fremantle if we are willing to embrace it. Embracing tourism would also mean embracing human scale development, because that’s what tourists come here for. If they want to see highrise they can go to New York, Singapore, Sydney, etc. They don’t need Fremantle for that, and Freo does not need it either. Is look the new like? For many years we have heard excited young people say like every third or so word, but now grown-ups seem to have their own like in look. I noticed last season that many AFL coaches answered questions during media interviews, starting with the word look. I also heard ABC football commentators doing the same. It is annoying, but even more so when a Minister in the Western Australian Government does it. This morning Minister Bill Marmion was ducking and weaving to try not to take any responsibility for the disastrous bushfires at Margaret River, during an interview with ABC’s Geoff Hutchison, but it was almost more annoying to hear this man start each and every sentence of his response with look. The state government has a huge media department, so surely someone could make the minister aware that he sounds like a less than articulate half-wit. What is his media secretary doing? Just writing spin, instead of advising the boss to speak like a proper grow up person, I assume. And look, guys, if you need a word to start a sentence with, listen would be the appropriate one to look for. You know, we look with our eyes and listen with our ears, so if you want to be heard, you’d better hope people will listen to your answers, instead of looking for them. 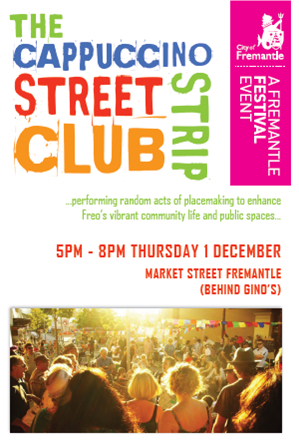 This Thursday is the start of the eclectic and very Freo CAPPUCCINO STRIP STREET CLUB in Market Street, Fremantle, behind Gino’s. Bring instruments, games, food, and big smiles to greet the ISAF 2011 visitors. WE, the people of Fremantle, are hosting the event, so let’s all behave like the most welcoming, inclusive and hospitable people on earth, because that’s what we are really. Show the world what Freo is like and hug an ISAF visitor today!! The delightful photo in today’s West Australian of Fremantle Mayor Brad Pettitt on the new boardwalk at Bathers Beach, and his exciting words about what ISAF 2011 means for the city, made me wonder again why the City of Fremantle has not done more to promote the event in town with banners and flags. A trip to East Perth this morning, showed the City of Perth having large banners on the streetlight poles on the medium strip of Adelaide Terrace. They are promoting ISAF better than we are in the city where it is held. There are none in the Cappuccino Strip or at Kings Square, let alone near Bathers Beach or the Round House, or on Victoria Quay. Shame on you Freo!